Himalayan 12 Inch Square Salt Block Grill Stone. 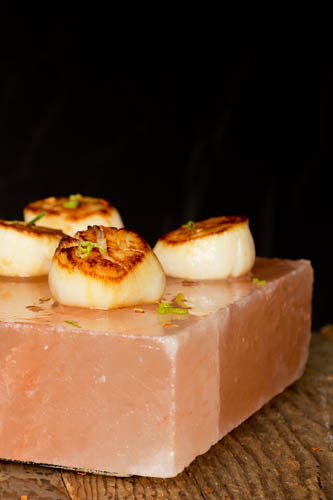 Extra massive size makes this the ultimate Himalayan salt block for cooking & grilling on! SilverFire 12" Square Himalayan Salt Block Grill Stone: Extraordinary Gourmet Bio-Fuel Cooking! Salt Block Cooking and Food Presentation that is fun and flavorful! Eating does not get better than this! Salt block cooking will expand your repertoire from cooking, to curing, cooling, freezing, caramelizing, browning, softening, firming, crisping, or simply showing off your dishes! It is counterintuitive, but salt blocks deliver modest flavoring in a deliberate mld, measured fashion; since salt blocks have only one solid surface that lack porosity and dissolves extremely slowly, compared to granular salt. Our 12x12x2 inch salt block can be easily heated on a single burner and is large enough to cook for a small dinner party. This block brings dazzle and dramatic flair to every meal, enhancing the flavor of every food you place on it and salting your food to perfection - every time! Hand-picked from the purest seams of 600 million year old salt deposits deep under the rugged Punjabi landscape, this salt block is suitable for freezing to -320°F (-196°C) and heating to 900°F (482°C); no other salt block has been tested to such extremes! Himalayan salt is rich in Iron, Calcium, & 80 other trace minerals. Salt block cooking reacts differently with foods according to moisture, fat, sugar, starch, protein, the temperature of salt, and the length of time in contact with the food. This is the ultimate in food discovery with grilling, baking, serving, and more! Himalayan Salt is the hottest new item in gourmet cooking! 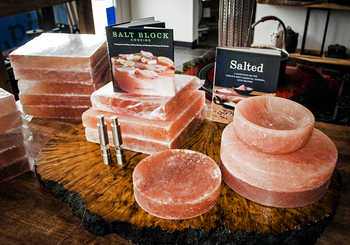 Himalayan salt blocks have little porosity, no residual moisture if safely heated or chilled. Although salt does not melt up to 1,473.4 Fahrenheit (800.8 Celsius), we do not warranty this product, due to the fact that it is a mineral stone with natural cracks and fissures. In the event cracks appear, just keep cooking and enjoying your stone. These natural imperfections are part of the beauty and discovery in the cooking experience. Your salt grille stone will eventually wear out. It maybe possible to also crack salt blocks by heating them up too fast. We are still learning about this wonderful product. They can transform food like no other grill. We have had some amazing dishes grilled on these salt blocks. You can also chill salt blocks to serve food on. The possibilities are endless. 1. Heat cookware grade salt blocks only. 3. Temper blocks if using oven. 4. Use proper hand protection and tools. 7. Take your time with the thick. 9. Scrub and sponge damp, not wet. * Salt blocks can crack. Heat them slowly. * Salt blocks can pop. Only use cookware-graded blocks (SilverFire only offers cookware-graded blocks). * Salt blocks get very hot. Handle them only briefly, using extreme caution, wearing professional high-temperature oven mitts. * Salt blocks hold enormous energy. Ensure there is adequate insulation between salt blocks and tables or counters. * Disclaimer: Cooking on salt blocks poses risks. If you wish to cook on one, please understand that you accept all responsibility. Heat your block slowly. It is a good idea at low firepower for a least 15 minutes then increase firepower by 10 minute intervals. Direct heat can be reduced on a bio-fuel stove by less fuel or heat baffles (cast iron plate, fry pam, aluminum foil, etc...). It will likely will take a 1/2 hour to react grilling temperature. 500 Fahrenheit / 260 Celsius is the ideal grilling temperature. An under heated salt stone may over slat your food. If you don't have a in fared thermometer, sprinkle a few drops of water to determine if they sizzle and disappear immediately. Another field test is to hold you hand 2 - 3 inches above grille stone, if you can't it is hot! Moist foods increase salt absorption and fat repels it. Metal spatulas are best for flipping food and scrapping off food residue. Do not use plastic. Water, cooking oil, and food residue will drip off stone edges, wipe with damp cloth. Clean after stone has cooled to room temperature, remove all stuck food matter. Do not use soap! The powerful antimicrobial properties of salt insure safety and future use. Wipe with sponge or scouring pad. Less water the better. Dry with paper or cloth towel and rack dry. Store in a dry, low humidity location for best results. Our Large 12" salt block is 2" thick and offers the greatest surface area for grilling. Perfect diameter for our Survivor rocket stove. It also will accommodate our portable Hunter, Super Dragon models, or our larger fixed chimney stoves. The square salt block grill stone does provide a slightly larger footprint.